Isaac replanted the winter cactus. Isaac: We can't find the roots anymore. Isaac: Because we hid them in the soil. 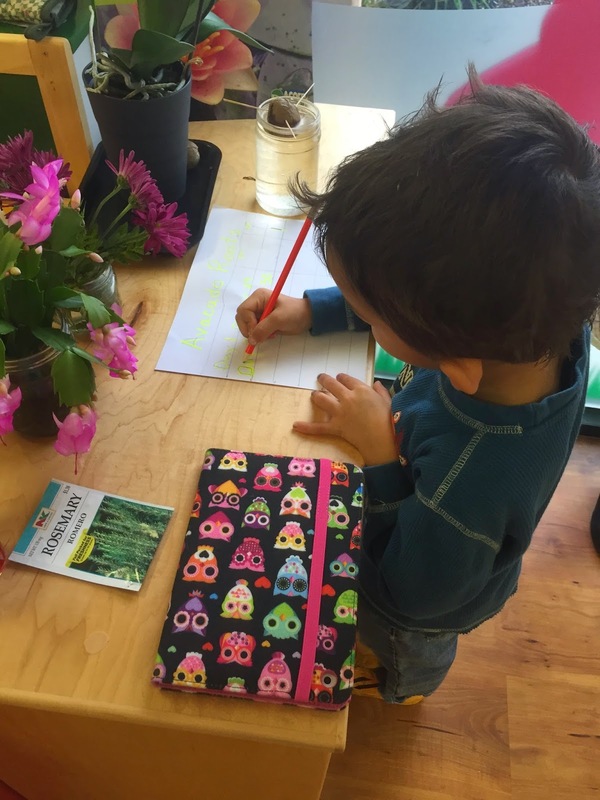 The children continue to explore plants. 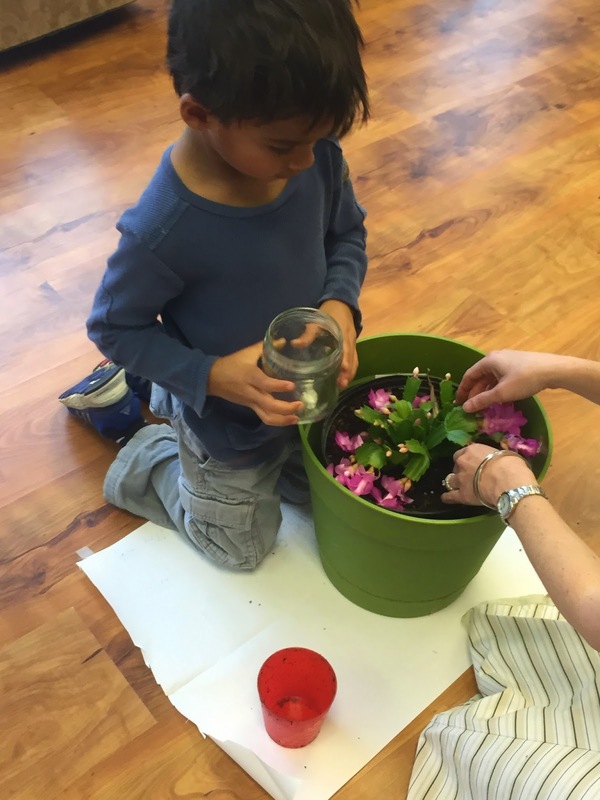 We are extending our understanding of plants in a few ways this week. Natan took the block tree that was laying on our floor and created vertically. 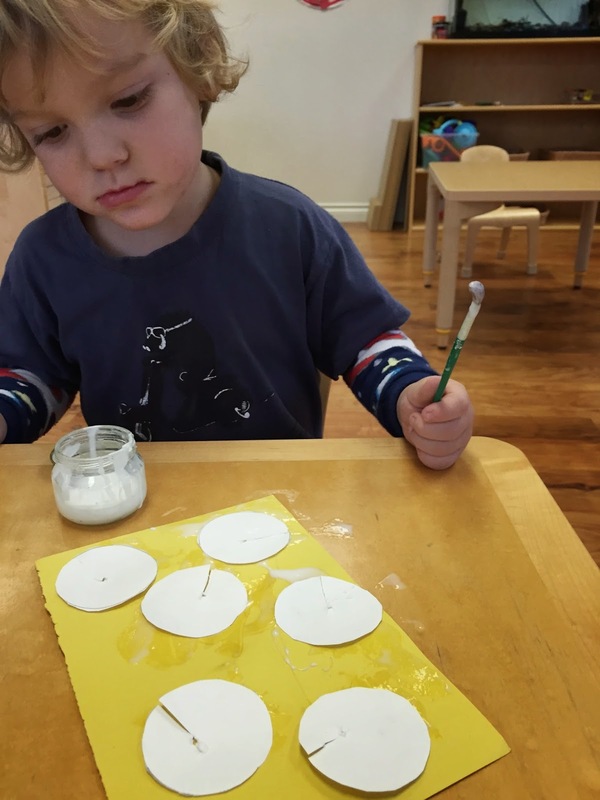 He created a tree and flower. He took a further step and labeled the parts of his block plants. 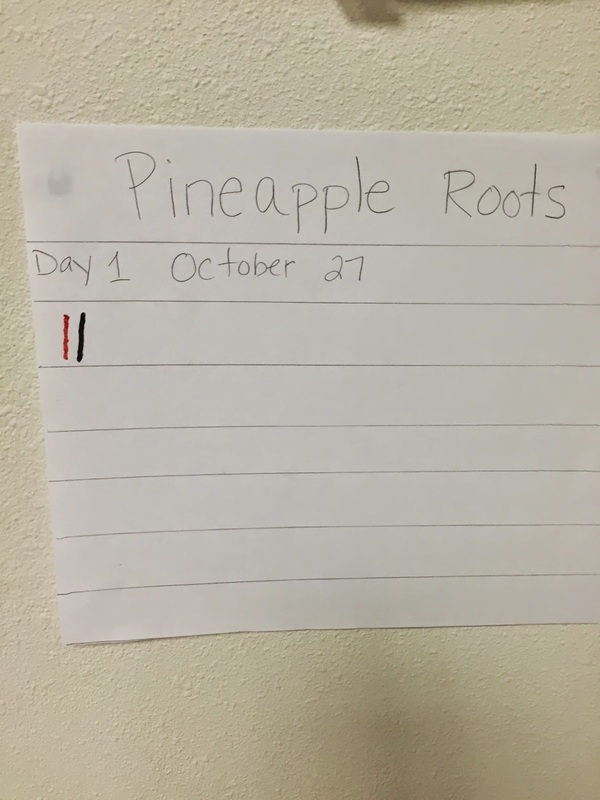 We began some root sprouting experiments. 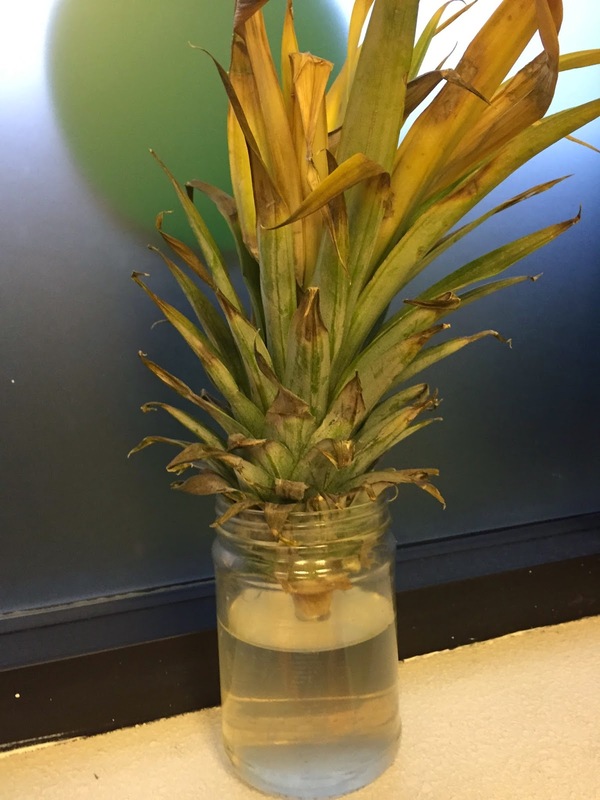 We twisted the stem off a pineapple. Morah Katie: We have tried this before, with zero success. This is one of the many things I like about science, sometimes things don't turn out the way you want. When that happens should you just give up? Morah Katie: We can always try again. Our expectation is that we can sprouts roots from the stem. It may or may not be successful, but we can try. We will also try to get an avocado seed to sprout. 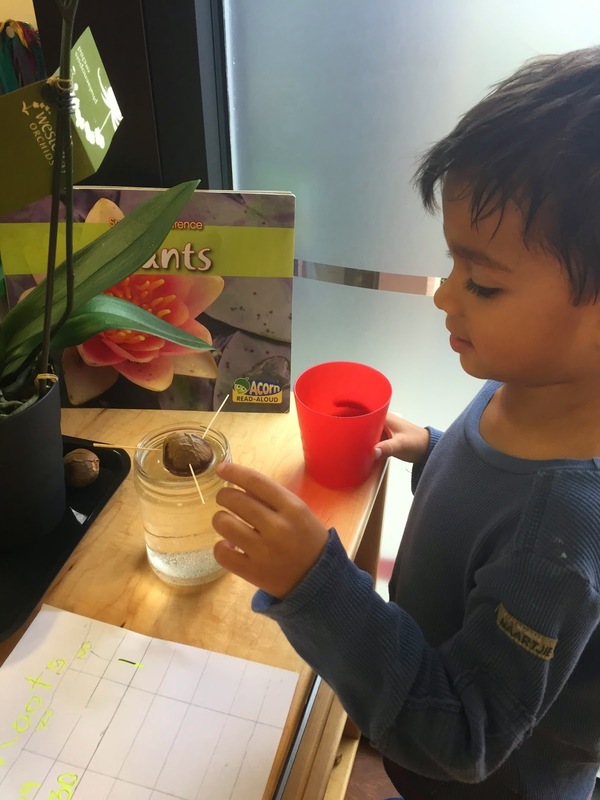 Morah Katie: How many days do yo think it will take for the avocado to sprout roots? Morah Katie: We may have to wait a while. We are keeping a chart for all our plant experiments to be sure to keep track of how long we wait. We discovered that maize/indian corn can also sprout roots. The maize was very intriguing. Abigail: Morah Katie what is this? Why is the corn purple? Morah Katie: We are going to experiment with the indian corn, or maize, and see if it sprouts roots. Abigail: It is so pretty. I like the purple. Morah Katie: How many different colors do you see? Abigail: Purple, yellow, white, blue red. Morah Katie: Would you like to make your own? Morah Katie: What will you need? Abigail: Glue and lots of colors. 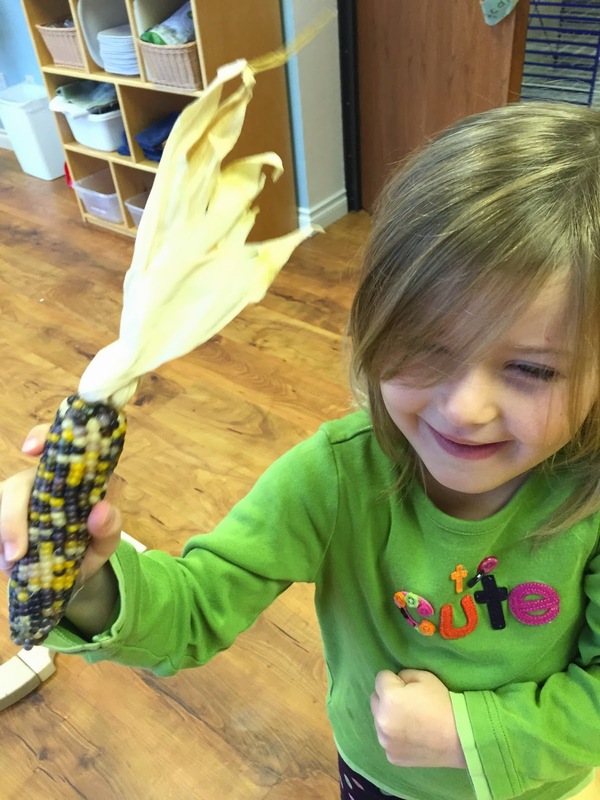 The colorful corn inspired conversation and an unexpected craft. The girls needed to decide what tools they would use to create their own "fancy" corn. 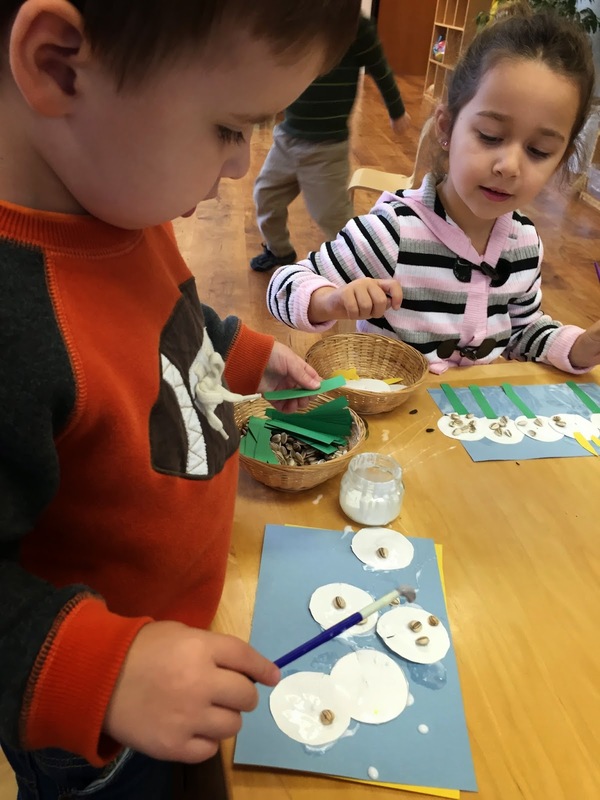 They gathered the supplies and set to work creating. 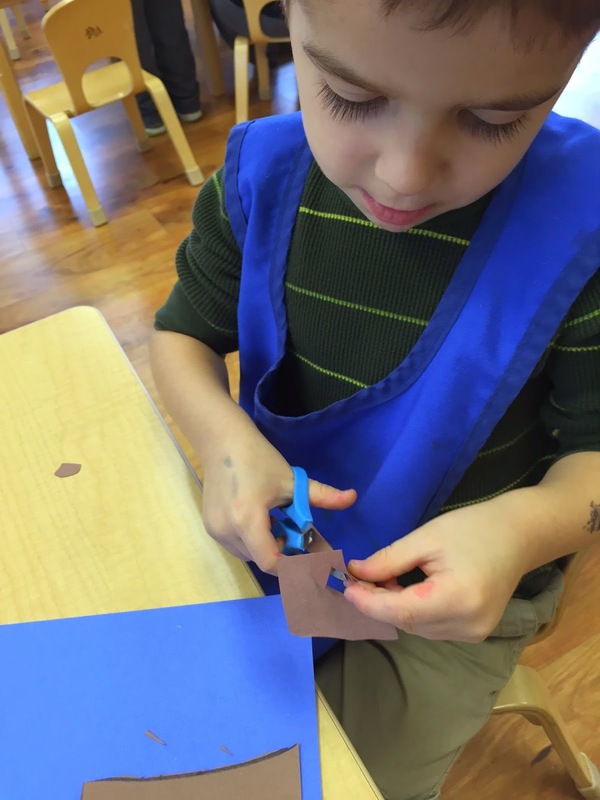 We indirectly expanded our knowledge of plants through crafts. We created our own Chicka Chicka Boom Boom coconut trees. Morah Katie: What do you need to create your tree? Sroli: A trunk and leaves. Anton: Coconuts, they are fruit. 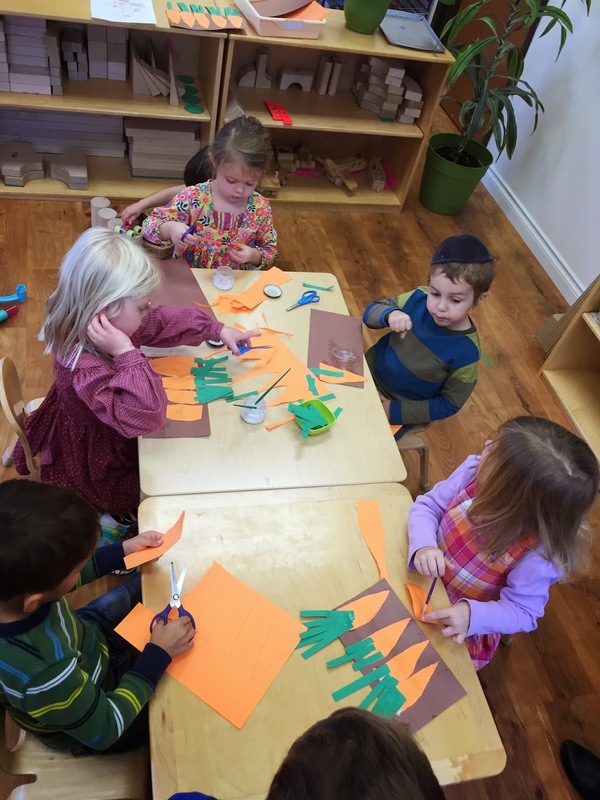 Morah Katie: How are you going to make your tree? 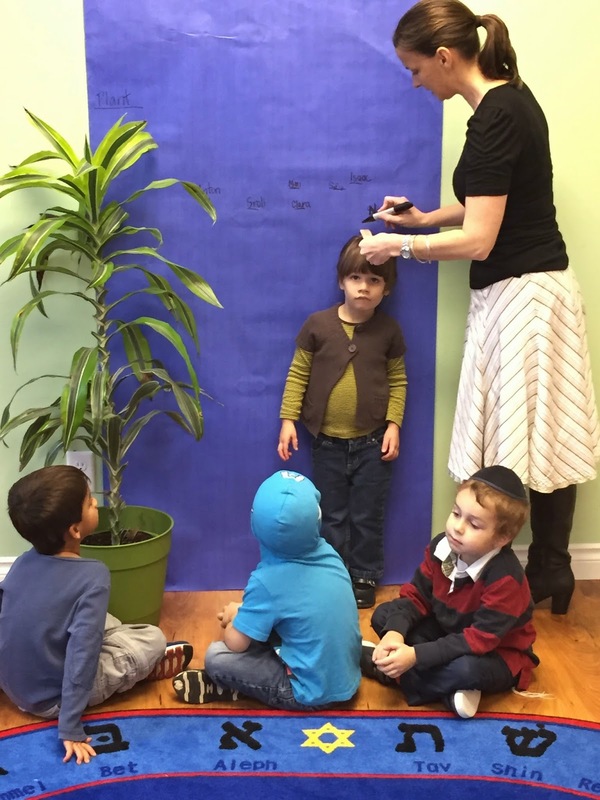 Morah Katie: What part of your tree will the alphabet letters climb up? Natan: The trunk, stem if not a tree. And my letters will be at the top of the tree on the leaves. We practiced and reinforced counting as the children created a carrot garden. Each carrot bottom had a number on it. The children cut the bottoms, then added the correct number of leaves for that carrot root. 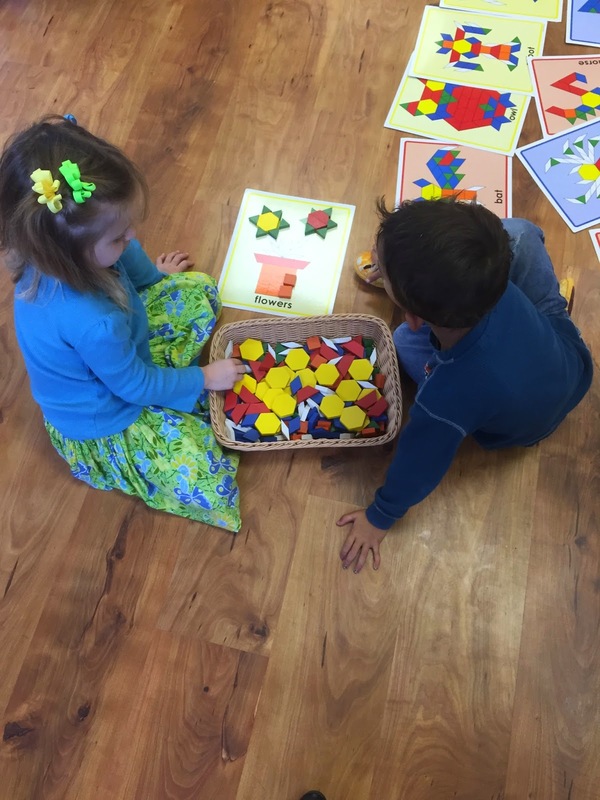 These activities provide the children with opportunities to share their knowledge with us. We used one of our tallest classroom plants to measure our heights. 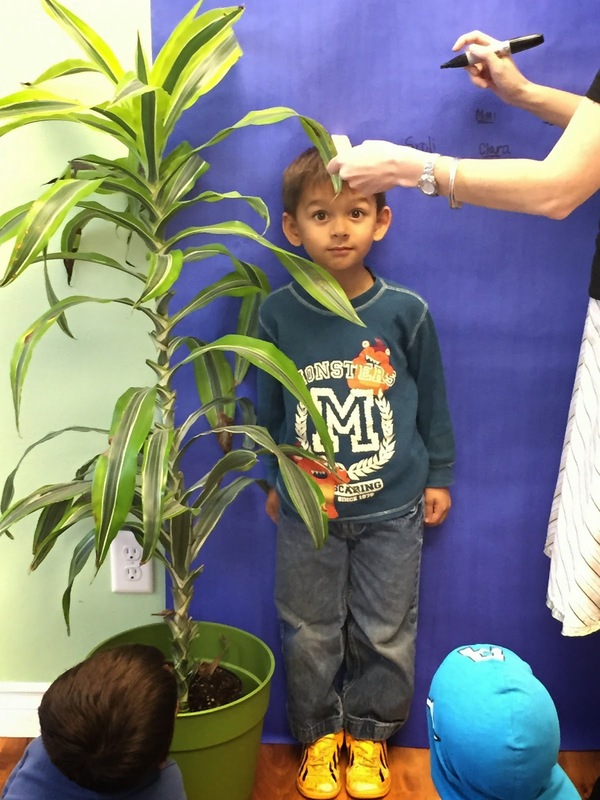 As of October 30, 2014 no one is yet as tall as the plant; we will measure in May and see if that has changed.